What an incredible dream to have come true - going to Israel. Such an amazing journey and very hard to put into words what you experience there. 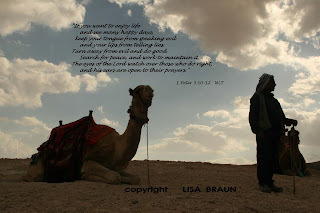 But I'm very excited to have put together this incredible glimpse into the lands of Israel, Jordan and Egypt for you. The calendar is mainly Israel but with a photo from Jordan and one from Egypt as well. Below each photo will be an explanation of what was happening or had happened in that are shown in the photo. I know you will be blessed by this calendar....enjoy. The above photo was taken near Haifa, Israel and we're overlooking the Meditarranean Sea. It was so incredibly gorgeous here....what a marvelous sunset God gave us this first evening here. I'll never forget this sight. Nearing the end of our trip, we drove into Egypt and stayed at St. Catharine's for 1/4 of a night. We had to wake up at 2 am so that we could leave with the bus at 2:30 in order to be at Mount Sinai, Egypt at 3 am to begin the climb up Mount Sinai. There were 26 of us who climbed up this mountain in the middle of the night, in darkness with only a handful of us having flashlights. It was a 3 hour climb up the mountain to the very top so that we could watch the sunrise at 6:30 am. What a sight that was!! I was a crazy nut and rode a camel up 2/3 of the way. My camel was a bully and wanted to be at the front so he bullied his way past the other camels and led the way up the mountain....I prayed the whole way "Lord, you must have an angel guiding this camel up the mountain because my guide is nowhere to be seen." It was a steep climb and the ledge was always very close to my camel's legs. It was a good thing it was dark and I could not see where we were walking. :-) After the 2/3 climb, I numbly got off the camel to rest my extremely sore legs so that I could walk up the 750 steps to the very top. Oh but was it worth it! If you ever have a chance to experience this, do it! Here we are on top of Masada, overlooking the Dead Sea in Israel. This was a fortress where King Herod lived part of the time, with swimming pools/baths and every luxury he could have back in those days. The Dead Sea in the distance is at 1,400 feet below sea level and here we are on top at sea level. Some guys walked up this mountain, including my hubby and my son but the rest of us took the cable car up. Incredible view here too. Just extremely sad at what took place up on this mountain. When the Romans took over the world so many years ago, over 900 Jews committed suicide here - they did not want to be ruled by the Romans. It took the Romans a whole year to build a ramp to get up here with their huge machines to break into this fortress. They were not expecting to find a fortress full of slaughtered Jews. Certain Jews believe that they were heroes but now the Israel community is now leaning towards it being an act of cowardness. Only 1 mother and her 2 children remained alive. Our 1st view of Jerusalem. We are standing on a spot near the Mount of Olives and directly below us is the Kidron Valley and we are overlooking the city of Jerusalem in Israel. Our Jewish guide had taught us a song - the song of ascent into Jerusalem. It doesn't matter which direction you take to come to Jerusalem, you ascend into the city because it is on a hill. It was quite emotional standing here, singing this Jewish song together as the rain fell on us and the sun shone through the clouds over Jerusalem. A very memorable moment. This is the most likely spot of the tomb of Jesus in the Garden of Gethsemane - this is the Garden Tomb in Jerusalem, Israel. It was so quiet and serene in this spot. Knowing that Jesus is no longer buried, that he had died for our sins, crucified, died, buried, but then he rose from the dead so that we could have life eternal. Wow! How could you not get emotional at a spot like this. There was singing and praying all around us, in different languages and some were speaking/praying in tongues....it was heavenly, absolutely heavenly. To walk into this tomb and see a sign that read "HE IS NOT HERE, HE IS RISEN" Yes, it spoke directly to your heart and you could not help but be deeply moved. Here we are at the town of Capernaum, Israel - this was a synagogue that Jesus had preached in and also the town of the Apostle Peter - we saw where his house was as well. I loved the marble pillars/rocks at this sight. It was so amazing to be in here and try to imagine how it would've been in Jesus' time. Ah, to express to you what my heart experienced when I saw this sunrise over the Sea of Galilee at Tiberias, Israel - this was the view from our hotel balcony...the peaceful holy moment of this morning is quite hard to fathom. We didn't experience any storms while we were here for 4 nights...just gorgeous peaceful mornings of incredible sunrises...and an incredible sunset while we were on a boat ride on the Sea of Galilee....that was another incredibly moving moment - to be on the sea that Jesus was on, and walked on, and to stand on the shoreline where he may have roasted the fish for his disciples one morning. Amazing experience. We walked the streets of a town in Israel and went into churches and walked through the markets. We passed this man sitting on the sidewalk holding out his hand for money on this street....it made me think of what Jesus would do if he had been there...he would have walked up to him and healed him. That would've been quite something to experience. I was so thankful to have this amazing time in the Holy Land. This photo was taken on the top of Mount Carmel, Israel - imagine the prophet Elijah defeating the 800 prophets of Baal with the fire of God coming down from heaven and burning up the sacrifice, the wood, and even the water around it...amazing! I stood here trying to picture Elijah running down this mountain in front of King Ahab's chariot running down to the town of Jezreel. The Jez'reel Valley is pictured down in the distance and to the left of it, is the valley of Armegedan where the last battle on earth will take place. Now that was a bit wierd to picture that...the last battle...hard to fathom but we know it's gonna happen because the Bible says so. The mighty Jordan River in Israel - imagine Jesus being baptized by John the Baptist in this river and God speaking from the heavens and a dove descending down. Wow! I've often pictured the river Jordan as "deep and wide, deep and wide...." like I often sang as a child. But, the river is not very wide but at places it is quite deep. Many places along the shoreline are very steep - if you were to step in, it would be quite deep right away - maybe even up to your waist. So, when the priests would have stepped into the water as they were carrying the ark, the water would have been quite deep right away. So wonderful to be able to picture these great Bible stories at all of these locations. Thank you God! Standing at Caesarea, Israel where the Apostle Paul began his missionary journeys was amazing...seeing the theatre, the complex where horse races would have taken place and trying to picture the huge shipping wharfe that King Herod had built here...wow! It was beautiful here and the sound of the waves crashing against the rocks and coming onto the shore was such an incredible sound...music in itself...and the water was so warm. I could've sat here and listened to the waves all day long. This young child was so adorable as he/she sat by his/her little box of rocks that he/she was trying to sell for "a dolla" each in the land of Jordan. When he/she realized that I had taken his/her photo, he/she wanted me to give him/her a dolla. So many small children were trying to sell their rocks or stones. That was how they helped to make a living for their family...sometimes it was sad to see though. But when they looked up at you with their adorable eyes, at times it was really hard to say no to them. I hope you've enjoyed reading up the stories behind each of these photos. If you ever get a chance to visit the Holy Land, don't pass up the opportunity...it's an amazing experience. It will change your life. God bless you all! Beautiful Pics!Love your Israel pictures.